Hip #2890 (catalog page, pedigree), a 7-year-old mare named MINADO, sells Mon., Nov. 15, 2010 at the Keeneland November mixed sale. Produce record: dam of 3 foals, 2 of racing age, 1 raced, 1 winner, 0 stakes winners. By the time Minado goes through the sales ring--she's cataloged for the end of Book 4's second session--the majority of buyers with $50,000 will have departed Keeneland's pavilion. Not only is it the latter half of the sale, but it's a Monday, and many buyers have caught a Sunday flight out across the street from Keeneland at the Blue Grass Airport. Last year the average price for this session was $20,343, with a $13,000 median. Minado's final bid should be in the top 10 percent of the session--she might even be be one of 12 to 18 hips to attract bids in that magical $50,000-plus category. I'm guessing right at $50,000--but I see lots of room for adjustment on this one, possibly a bid or two higher, but more likely as much as $10,000 under that figure..
Why am I predicting Minado to sell for as much or more than she did a year ago? Simple: she's still young at 7, so there's no prejudice against her for age. She has had an improvement to her immediate catalog page since a year ago. Her 2007 Lion Heart gelding, He's Got Heart, has won once and been on the board four additional times from 10 starts in 2010--this is her first foal and the only one yet to race, so it's a noticeable change, albeit a bit more research reveals that the gelding is running at lowly claiming levels. But the most important factor that adds value to Minado as a broodmare is that she is offered in foal to a $25,000 stud this year, compared to a $12,500 stallion in 2009. 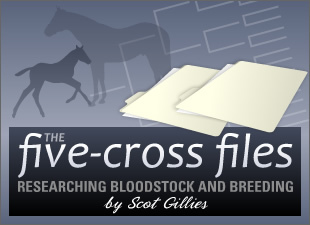 In my post title I claim that Minado has a "broodmare pedigree." Some of you reading the "unraced" notation might argue that her catalog page is far from what you'd prefer in the perfect broodmare. But I'll point you to her three-generation lineage. Her sire, Coronado's Quest, is currently the youngest stallion on the 2010 Leading Broodmare Sires list. This seems to be a trend: tied for youngest broodmare sire on the 2009 list was Roar, another son of Forty Niner. Forty Niner himself was the youngest top-100 damsire in 2001, and tied for youngest in 2002. Minado's second damsire, Nureyev, is also a longtime leading broodmare sire. Minifah, dam of Minado, is dam of two stakes-placed winners and granddam or great-granddam of several good stakes-winning and stakes-placed horses. Minifah is out of All Rainbows, making her a half sister to the great racemare Winning Colors, winner of the 1988 Kentucky Derby (gr. I) and two other grade I contests. All Rainbows, in turn, is a half sister to Chris Evert, champion filly (and distaff triple crown winner) in 1974 and granddam of multiple grade I winners Chief's Crown (a champion juvenile who placed in all three 1985 Triple Crown races) and Classic Crown. Minifah and Minado seem to be from a less robust branch of a Thoroughbred female family that traces back to Miss Carmie and Twice Over and Two Bob, but I've always felt that latent genes will be revitalized with wise mating choices. Minado comes from a family that produces strong runners and strong broodmares. The question is, are those genes the ones she'll pass along? One clue would be to see her previous offspring. You'll have one convenient opportunity at Keeneland November: her War Front weanling is offered as hip 2891.